Bao Lanfang, second from right, whose daughter-in-law, son and granddaughter were aboard Malaysia Airlines Flight 370, kneels in grief while speaking to journalists outside the company's offices in Beijing, Aug. 6, 2015. Malaysia’s announcement that debris found off a French island belongs to the plane at the heart of the world’s biggest airline mystery, has done little to answer the persistent questions of Chinese families of those on board the flight. In Beijing, Chinese family members and relatives of those on board missing Malaysia Airlines Flight MH370 say the announcement made by Malaysian Prime Minister Najib Razak has only fueled their anger and frustration. One of their biggest concerns and questions is why the announcement was made, even when some have yet to give a final confirmation that the debris indeed belongs to MH370. Malaysian Prime Minister Najib Razak, center, gestures before speaking at a special press conference announcing the findings for the ill fated flight MH370 in Kuala Lumpur, Malaysia, Aug. 6, 2015. Steve Wang, whose mother was on board the Beijing bound flight that went missing more than 500 days ago, calls the announcement irresponsible. “If you don’t have 100 percent (certainty), it is 99.9 percent and that it is still a might be. 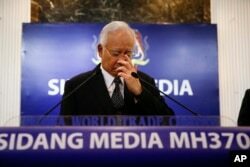 I don’t know why (Prime Minister) Najib wanted to give such kind of a conclusion in such a hurry,” Wang said. Another family member who spoke with VOA on condition of anonymity says the decision to make a hurried announcement before France issued a final conclusion is not only irresponsible, but raises questions about Malaysia’s true intentions. Family members say they are not in denial, but that they owe it to their loved ones to not just declare them lost without 100 percent certainty about what happened to the flight. In his announcement, Malaysia’s prime minister said an international team of experts had “conclusively confirmed” that the debris belong to the missing plane. However, prosecutors in France, where the debris is being examined, say there is a “very strong presumption” that the portion of a wing that was found belongs to the plane. Chinese family members say that both French investigators and Boeing – the maker of the aircraft – should confirm that the flaperon belongs to the MH370. On Thursday, officials couched their comments about the development. Australia’s Foreign Minister Julie Bishop confirmed that the search for the missing plane would continue, adding that “once the French team confirms” the debris belongs to the plane, a further analysis of currents, drifts and winds would begin. U.S. Secretary of State John Kerry, who is in the Malaysian capital of Kuala Lumpur for a regional conference, told reporters that the discovery of the flap on Reunion Island has once again opened wounds. "The U.S. hopes that the debris that was discovered on Reunion Island — if it is found to be conclusively from the aircraft — will help to bring some sense of closure," and perhaps help narrow the search area for the plane, Kerry said. China’s Foreign Ministry expressed its sorrow and sympathy for the families of those on board and urged Malaysia to make good on its commitment to fully investigate the crash. "We advise Malaysia to give some further explanation to the passengers' relatives based on the development of the situation," said Chinese Foreign Minister Wang Yi. "I think we must give full consideration to the passengers relatives and those on board and give full consideration to the sufferings they have been through." Malaysian Airlines Flight MH370 disappeared on March 8, 2014 and is believed to have gone down in the Indian Ocean, nearly 4,000 kilometers away from where the debris was found on Reunion Island.